Geert, if I understood you correctly, what happens is that you submit the form, which causes the conditional email to be sent to your users, telling them that they are rejected and that they can make edits by following the edit link. Then, as they fill out the form, they fill it out and submit only to get the same email notification (of failure). Now to resolve this, my suggestion would be to add additional fields to your form which are shown if your staff members set the submissions as rejected. So once they set it as such, they (your staff) will also see these fields, but they just ignore it/them, while the user that comes to the form will see a new field shown. This way they have the radio button to say yes or no, where they will select Yes each time, so you have one more thing to base your conditions on. I hope that this is easy to follow, but if not, do feel free to give us the link to the form with this setup and we will check it out for you and implement the same for you to see it in action. Thanks Ben for your answer. The thing is, the user needs to fill that one in. But the manager reaches the form first to review the data. Therefore it can't be mandatory which means it's not a good indicator right? What I tried as well is to hide the field that triggers the management options based on the =edit url, and trigger a new field with the same function which would be blank (that is the goal). That could be the solution but the system seems to go in a redirect loop. I think the only solution would be to empty the value of the field after submit so that it can be used for "unlocking purposes". Unfortunately Geert, if you clear out the fields before they are submitted, the conditional emails would not work. Now what I had in mind is to show the user the field once your management staff make their decision with a negative outcome for the applicant. Then the field would be obligatory for those that come to the form again, but would otherwise not be something shown to them. So basically this makes it impossible to make any real changes over the URL and allow them to clear these fields in some manner. 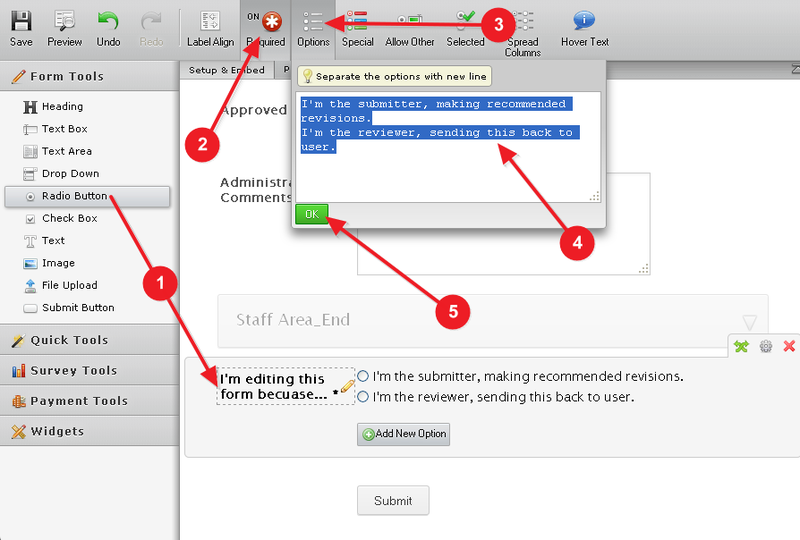 If cleared before your staff submits, as mentioned above the conditional emails would not be triggered. So the only option here is to introduce this additional field that we can check against to make sure that the user is being sent the right data. Would this be something that would work for you? Thanks Ben, but still with both solutions the admin and user enter the form again via the same edit link which makes it impossible to make that field mandatory so it is not bulletproof. Could we maybe have a chat session about this? I think it's quite hard to explain this way. I'm afraid that we don't have chat support available at the moment, but we will be happy to help you through this forum. I believe I understand what your requirement is. While we can't achieve what you are after directly with an Edit Link, because it populates fields with all the data users had initially submitted, we can get your desired behavior by either using an additional field as my colleague has explained above, or by using clear field values on hide option. I have done some tests on a cloned version of your form, and it already appears to function the way that you had described, without needing the Drop Down field called Do you want to, nor any conditions that target the referrer. My initial submission sent emails to the submitter and the reviewer. After making another edit as the submitter, that text was no longer entered in the Revision remarks field. It looks like your form is already behaving the way you wanted. Please let us know if that is not the case, and we will be happy to help further. Thank you. Just tried to confirm this but I experience something different. Once the user goes back to change the content after it was rejected, the projectcode is still filled in with "wash2015". This means revision options are still visible right? In addition, one of my conditions does not work which would help to solve this one. 1. in edit mode after review, it hides PO Project code. 3. When this happens, it should show the Project code (2). If after edit of the data the manager comes back to the form management functions can be unlocked again by filling in the secret code. Do you have any idea why this is not working? I am sorry, the described workflow with the Get Referrer widget will no longer work since last weekend. The reason is that the actual HTTP referrer is always the website from which you had come to the form, rather than the page where the form is. Our developers have fixed the referrer widget over the last weekend to get the actual referrer, which is something it was originally meant to do. This unfortunately means that the conditional rule that was using the referrer before will no longer work in your previously described desired manner. As we can't use referrer that way any longer, let me try to see if there is some other workaround we can try. I will let you know through this thread if I manage to come up with a solution. Ah that is bad luck. Hope we can figure something out as my client wants to continue. Now we can not give you any specific timeframe as to when this would become available, but I do believe that it will not be long, since this new widget would basically be the old referrer widget, with some tweaks, but most time consuming would (I only presume) be the new graphics and design work. If you wish, do let us know here that you are interested in knowing when this widget is available and we can move it to a new thread for you and raise it to our developers, or you can simply leave your comment there and we can do the same. That way you will be notified as soon as it becomes possible, but I must say that it might not be able to capture the correct details. 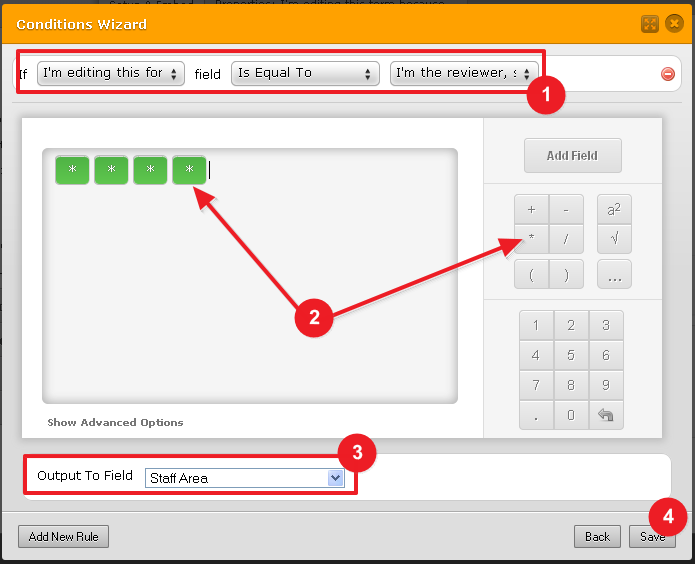 For example, when you go to the form for the first time you can add different parameters, like ?name=Bed&task=answer but if you submit and go to the form over the edit link and add additional parameters, like ?mode=edit&name=test, you will see the name being shown as test instead of Ben and then quickly changed to the old value. The same is how the widget had worked earlier to my knowledge, so it is likely that this is the same way that it will work again. Now I do remember that we had a setup on one (private) thread where staff would add their comments, but as the edit page was public, the fields had to be hidden. So a set of checkboxes was used to hide the fields before the submit. Basically condition is checked to see if the right code was entered into the field. If it is, show the set of fields. Now once you click on the hidden checkbox, the input box is cleared out, or replaced with stars and in doing so all the fields are again hidden. I will create a quick demo of this and will update you here shortly to see if that would work for you. While the checkbox holds yes, no matter if you select Yes or di-select it, it will always cause it to be hidden. The Staff Area code is 123. Do let us know if that would work and if you have any additional questions. I made the changes you suggested. However, if the user comes back for the review, "rejected" is still selected (hidden). While submitting the change that e-mail is being triggered again which is strange for the user. Do you see any possibility's for this? To be honest I think there will always be a dead end to be honest. The only way that comes to mind Geert is to set some field that user enters so that it is empty when you submit the form, then as the user comes to the form again, they fill it out, again, which then causes the conditions to clear out the message that you have posted for your user and in doing so, it will send the email properly. I hope this makes sense, but if not, I would be happy to create a demo of the same, but would need to ask you what you think would be a good field to empty? I was thinking of emptying the email field of the user - which is required while the email is copy pasted into another field in the staff section. Which is used when you send the notification. This would require that the email field is conditionally set as non required while the user seen submit button is disabled (until they enter the email). - Sounds a bit complex, but I would be happy to, as mentioned create a quick demo if that seems as something that would be OK with you (to always copy paste the users email to staff segment). I have added a required radio button field at the bottom of this form, just above the submit button. This field is named "I'm editing this form because...", and is conditionally shown to the user is administrator comments have been entered by a reviewer. I'm the submitter, making recommended revisions. I'm the reviewer, sending this back to user. So the first time your users come to the form, they will not see this field. 2. If "I'm editing this field..." is equal to "reviewer", then also hide the "I'm editing this..." field. 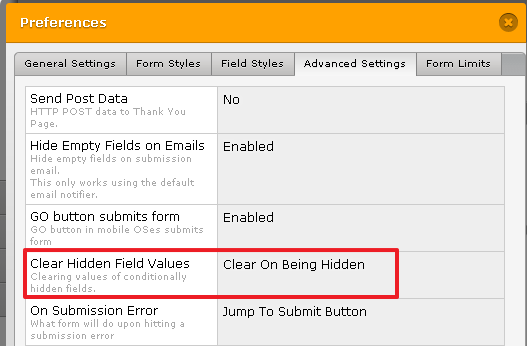 Hiding the field will automatically empty it, due to the preference about clearing fields when they are hidden. 3. If "I'm editing this field..." is equal to "submitter", then hide admin comments (which makes them empty) and hide "I'm editing this..." (also makes this field empty). Note that I did not set any emails to be sent, but I have confirmed it working in desired way by looking at my submissions page in real time, and using the Edit Submission link on the thank you page of my demo form. I can see that this can be applied to your form as well, though we would need to make some edits on your form - remove some of the old conditions, remove one of the submit buttons, add another Form Collapse tool just above the submit button, etc. However, it is very much doable, and doesn't rely on the Get referrer widget (or its soon to come substitute). Please let us know if you hit any snags in setting it up, and we will be happy to help. We recommend that you clone your main form first and test making these changes to the clone, so that you don't end up with a non-working main form accidentally. It looks like it is fixed. Thanks a million for your work so far, this is really outstanding support! We always try to do our best to help. If you need any other assistance with your forms, just let us know in a new thread, and we will be happy to assist.